These table linens, white round tablecloths feature a construction that makes them ideal for large scale commercial use. The superiority of these table covers comes from a combination of traits that are specifically tailored to meet the needs of the hospitality industry. 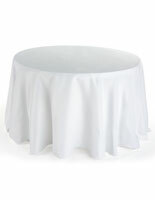 Reception halls, restaurants, and hotels find these white round tablecloths to be superior to other, linens. These table cloths, also known as runners, fit seamlessly into any setting or décor. These white round tablecloths look crisp, while not detracting from its surroundings. An 11' diameter makes them ideal to drape over round tables 6' across. 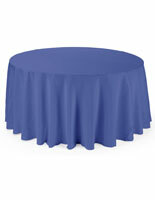 The white round tablecloths called linen, or table skirts, feature a construction that is 11' in diameter. 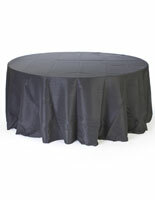 Draped across round tables 6' in diameter, the linen provides 30" of cloth to evenly fall over all sides of the table. 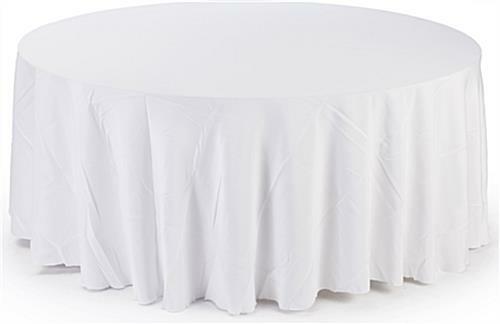 We manufacture these white round tablecloths from polyester. This fabric is readily available, helping to keep the overall price at a minimum. 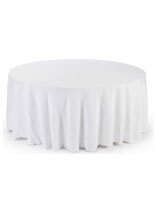 These white round tablecloths featuring a polyester construction have several advantages over linens made from more expensive, and often less durable material. 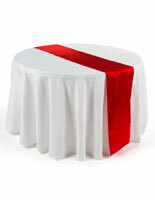 These table linens are featured at a discount price that makes them an incredible value! 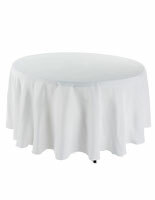 These linens are white round tablecloths that are machine washable and wrinkle resistant. Not only does this linen feature a combination of style and functionality not often found in French linen. 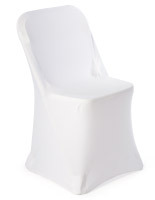 Additionally, white round tablecloths made from other materials are often more expensive.